Are you a chronic pain sufferer looking for relief beyond the level you've been able to achieve through medications, physical therapy, and other common interventions? Have you struggled with pain for more than a year and believe you have gone as far as you can with the treatments you've received so far? Have you been told that you need to learn to "live with your pain" because for you it will always be a chronic condition? The research supporting the effectiveness of hypnosis and specific mind-body exercises for the treatment of chronic pain is overwhelming. However, there is only a small community of therapists who are truly qualified to do this work. After investigating and interviewing the candidates to create an audio program on relieving chronic pain for us, we believe we have found the very best. Maggie Phillips, Ph.D. is known world wide as an expert in the field of mind body healing and pain management and often consults with professionals to help their patients who are taking toxic levels of medications and still unable to control their pain. Her techniques have helped many chronic pain patients dramatically reduce and in some cases eliminate the need for pain medications. (more about Dr. Phillips). Designed for people who are not responding to typical pain interventions, this program will provide you with a thorough understanding of how pain works, and will provide you with the tools to overcome it. 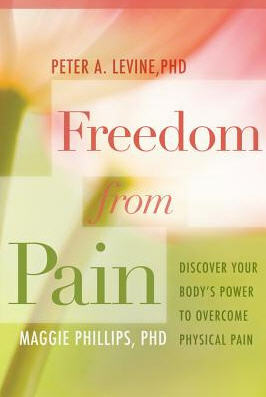 The first CD of this program will provide you with detailed information about how pain works. It is important that you understand these foundational skills so that the exercises on the remaining three CDs be effective. This CD also contains information that you can share with your doctor. The next three audio CDS provide over 10 guided exercises where you will learn essential skills that act to reverse the course of chronic pain. To develop each skill, you will learn to use special tools derived from guided imagery, self-hypnosis, yoga and Pilates, and Energy Psychology. To read an excerpt from the course, click here.  Larry had undergone more than 20 surgeries for his knee and was being treated at a pain clinic by several pain medications at doses 8-10 times greater than usually recommended with very little relief. In working with Dr. Phillips, Larry learned to reverse his pain levels so that now he is on almost no medication, is comfortable at least 90% of the time, and is beginning job retraining to return to work.  Lois, a woman with chronic pelvic pain, was despondent after several surgeries, each one resulting in temporary relief followed by a progressively downward spiral of functioning. Lois was on maximum doses of neurontin, antidepressants, and narcotic pain medication, and was frightened that she would never return to work and might become a home-bound invalid. As a result of her work with Dr. Phillips, Lois is now working out of her home, has tapered off all pain medications, has resumed most of her everyday activities, can enjoy travel and exercise, and is relatively free from depression.  Maria survived a terrible head-on car collision that left her with a broken pelvis, cracked vertebrae and ribs, and multiple soft tissue injuries. She had ongoing flashbacks of the accident, experienced constant physical pain, had difficulty sleeping, and was depressed because she could not work or exercise and was gaining weight. She was afraid her life was over at age 25. After working with Dr. Phillips, Maria resumed work, is no longer on medication, and has resumed almost full pre-accident activity and work levels. She is confident that she can maintain these results on her own because of the tools she has learned. Learn to reduce if not eliminate Chronic Pain through advanced hypnosis and Mind-Body exercises. The culmination of over 20 years of research by Dr. Maggie Phillips, this program can help you get your life back. Order the Pain Solution CD set risk-free directly from the Hypnosis Network for $119. Order online at http://hypnosisnetwork.com/hypnosis/pain_management.php or call the Hypnosis Network toll free between 9 AM and 5 PM CST Monday through Friday at 1-888-332-6463 (international callers dial (+1)817-566-0050). When you order, you will also receive a free gift: The Coping with Stress and Anxiety System (a $39 value). The Hypnosis Network offers a One-Year Money Back Guarantee: We are confident that you will find this CD program to be uniquely effective, safe, and affordable for the relief of chronic pain. If you commit to this program, you will experience significant relief from your pain or you pay nothing. Like all of our programs, we give you one full year to try it out. And if at any time you feel like it is not delivering the results promised, just send it back for a full refund of the product price. If your pain includes headaches, then you also might also benefit from the headache CD. "This is an outstanding CD series, presented by one of the leaders in the field of hypnosis and mind-body medicine. Dr. Phillips demystifies how chronic pain affects the interface between our physiology and emotions. Particularly useful is the progressive curriculum, where each new skill builds on what was previously taught. These 4 CD's contain a treasure chest of powerful, practical techniques for taking control of chronic pain. I recommend it enthusiastically, and will encourage my patients with chronic pain to use it." "Hypnosis: The Pain Solution, by Dr. Maggie Phillips is a sound, compassionate, and well-structured program that offers many different therapeutic possibilities for people suffering debilitating painful conditions. I appreciate its intent as well as its range of methods, and I highly recommend it as a vital part of any multi-dimensional pain treatment program." "Maggie Phillips is a superb clinician. In hypnosis we treat patients/clients with words, and her smooth, mellifluous, and cadenced presentation will assuage anyone who is willing to listen."